Yes! There is an exercise god! Chair exercises! You are able to exercise and warm up while you're sitting in a chair. Chair exercises for seniors of all ages are slow movements you can do while you are sitting down. They allow you to warm up and stretch your muscles safely. These exercises in a chair are great especially when you have foot or other pains. Pains that can make it a little too challenging for you right now to do our regular Stretching Exercises standing up. Posture is always important for chair exercises. Interlace your fingers, then straighten your arms out in front of you with palms facing out. 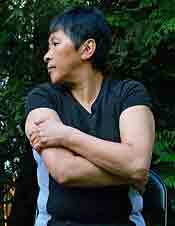 Feel the stretch in arms and through upper part of back (shoulder blades). Hold for 20 seconds. Do at least twice. 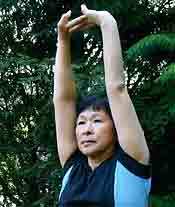 Interlace fingers, then turn palms upward above your head as you straighten your arms. Think of elongating your arms as you feel a stretch through your arms and upper sides of rib cage. Hold only a stretch that feels good. Do three times. With arms extended overhead, hold on to the outside of your left hand with right hand and pull your left arm to the side. Keep arms as straight as comfortably possible. This stretch the arm and side of body and shoulder. Hold for 15 seconds. Do both sides. Hold your right elbow with your left hand, then gently pull elbow behind head until an easy tension-stretch is felt in shoulder or back of upper arm (triceps). Hold an easy stretch for 30 seconds. Do Not Over-stretch. Fingers interlaced behind head. Elbows straight out to side. Upper body in good, aligned position. Pull shoulder blades back together to create a feeling of tension. Hold 8 to 10 seconds, then relax. Do several times. Good for tense or tight shoulders and upper. Hold your right arm just above the elbow with your left hand. Now gently pull your elbow toward your left shoulder as you look over your right shoulder. Hold stretch for 10 seconds. Do both sides. 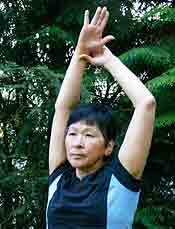 A stretch for the forearm: with the palm of your hand flat, thumb to the outside and fingers pointed backward, slowly lean arm forward to stretch forearm. Be sure to keep palms flat. Hold for 35 to 40 seconds. Do both sides. You can stretch both forearms at the same time if you wish. •	Never force a stretch. •	Do these stretches slowly and carefully. •	You may feel some tension. This is normal, but you should not experience pain. • Only hold a stretch that feels good. While seated, slowly point your toes forward away from your body until you feel a slight tension. Hold 20 - 30 seconds. While resting your heel on the floor, pull your feet and toes back toward your body. 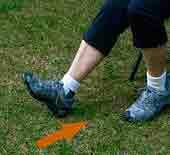 As your leg gets stronger, you can add ankle weights if you are interested in strengthening your leg muscles further. You can do one leg at a time or hold both up together. Medical Notice: It is not the intention of this article to provide specific medical advice, but to provide users with information to better understand their health and their diagnosed disorders. This article is presented for general information purposes only. Specific medical advice should be obtained with a thorough physical examination from your health care provider. consult with a qualified physician for diagnosis and for answers to your personal questions. Ready To Take Your Chair Exercises To The Next Level? This highly regarded DVD hosted by John Schlorholtz called Chair & Standing Routines, Ageless Yoga is really exceptional. 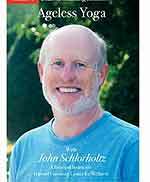 John has been a principal yoga instructor at Harvard University Center for Wellness for over fifteen years. Be sure to read the user comments at the bottom of the page after you click. 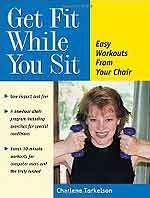 Many people really love Get Fit While You Sit: Easy Workouts for the Young at Heart by Charlotte Torkelson. Great! Aren't these chair exercises a great way to get the old bod ready for a bit of walking? Time to head back to your Fitness Walking Program and carry on feeling great again! Back To Let's Start Walking!